New technology converts exhaust heat into electricity for vehicles and other applications. Prof. Son's team has developed liquid-like TE materials that can be painted on almost any surface. Scientists hope that their findings, described in the prestigious journal Nature Communications this week, will pave the way to designing materials and devices that can be easily transferred to other applications. The output power of thermoelectric generators depends on device engineering minimizing heat loss, as well as inherent material properties. According to the research team, the currently existing liquid-like TE materials have been largely neglected due to the limited flat or angular shape of devices. However, considering that the surface of most heat sources where these planar devices are attached is curved, a considerable amount of heat loss is inevitable. 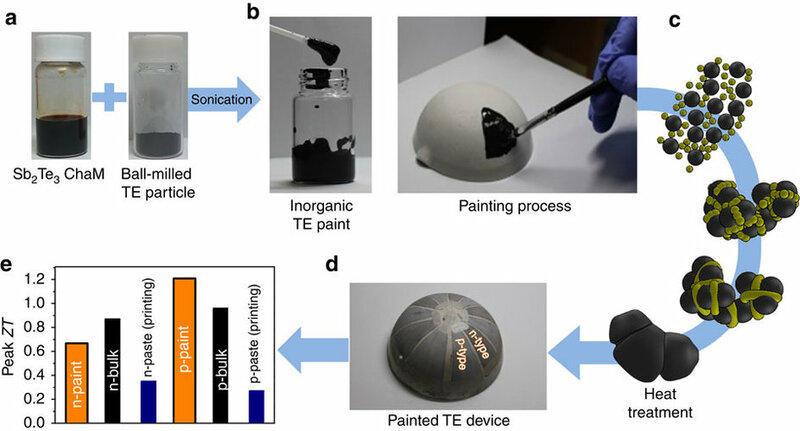 To address this issue, the research team presented the shape-engineerable thermoelectric painting technique where they they directly brush TE paints onto the surface of heat sources to produce electricity. Using this technique, one can now easily achive electricity via the application of TE paints on the exterior surfaces of buildings, roofs, and cars. Scientists hope that their findings, described in the prestigious journal Nature Communications this week, will pave the way to designing materials and devices that can be easily transferred to other applications. Comparison of power generation between the conventional planar-structured TE generator and the painted TE generator on a curved heat source. To show the feasibility of the currently proposed technology, they also fabricated TE generators through painting TE paints on flat, curved and large-sized hemispherical substrates, demonstrating that it is the most effective means of heat energy collection from any heat sources with exceedingly high output power density of 4.0 mW cm−2, which is the best value among the reported printed TE generators. This study has been supported by the R&D Convergence Program of National Research Council of Science & Technology (NST), as well as the Global Frontier Project and New Researcher Support Program by the National Research Foundation (NRF) and Ministry of Science, ICT and Future Planning (MSIP), South Korea. Sung Hoon Park, Seungki Jo, Beomjin Kwon, Fredrick Kim, et al., “High-performance shape-engineerable thermoelectric painting”, Nature Communications 7, Article number: 13403 (2016).